Covering an area of 46,000 square meters just opposite Sheikh Zayed Grand Mosque, Wahat Al Karama is a cultural landmark built to commemorate the UAE’s heroes. It reflects the UAE’s pride and gratitude towards all those who have given their lives to uphold the country’s sovereignty, dignity, and values. The 31 massive aluminum-clad engraved panels of The Memorial are the most prominent feature of Wahat Al Karama, which also includes a wide 4,000-square-metre circular space with a reflective pool – The Memorial Plaza. Visitors can head to the Visitors’ Center (open every day from 9:00am to 7:00pm) to join one of two daily tours (10:00am or 5:00pm). 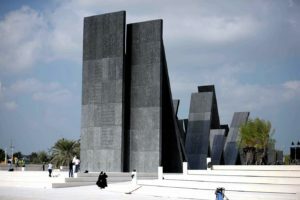 Wahat Al Karama also houses the Pavilion of Honor – a solid, regular polygon structure with a circular internal wall bearing the names of the UAE’s heroes. The site is open to the public, free of charge, every day from 9:00am until 10:00pm. There are plenty of historical and contemporary sites for visitors to explore in order to obtain an understanding of the local culture and heritage. These include several forts and heritage sites where entrance is mostly free or minimal. Sunset dining onboard a commercial dhow (traditional boat) or luxury yacht is an excellent way to enjoy awesome views of the city skyline, Corniche and Arabian coast. Most cruise packages offer a-la-carte or buffet dinners as well as welcome drinks. Experience the Arabian desert with an exhilarating dune-bashing adventure where you will be driven off-road in a four-wheel drive (4WD) on tricky desert sand dunes. Standard tour packages include camel rides, dune bugging and sand skiing, before concluding in a barbeque dinner on a desert camp under the starlit sky.Full day safaris include driving through Bedouin villages and camel farms in the desert, mountain climbing and watching traditional falconry demonstrations. Traditional and cosmopolitan, Abu Dhabi is a shoppers paradise; visitors can browse the emirate’s traditional markets (souks) or visit designer shops at the modern shopping malls. The largest of the malls in Abu Dhabi are Marina Mall and Abu Dhabi Mall, and home to a wealth of prestigious brand names.For traditional souks, Al Ain Souk is well worth a visit whilst Abu Dhabi offers the Iranian Souk, the most authentic in the city, and the Al Meena Souk which is a must for visitors looking for carpets. The modern-day mall of Madinat Zayed Shopping Centre offers an extensive selection of gold and jewellery. Take a glimpse at the Capitals rich cultural heritage and experience first-hand how Abu Dhabi’s Bedouin lived in traditional desert encampments before the modern irrigation and agricultural system came to existence. The Abu Dhabi Heritage Village, situated near the Abu Dhabi Breakwater (close to Marina Mall), also features several workshops that simulate old-fashioned metal work, pottery and weaving, a min-museum and a number of shops selling local handicrafts, spices and souvenirs. The majestic Sheikh Zayed bin Sultan Al Nahyan Mosque is probably the most imposing religious and national landmark in Abu Dhabi to date. It is also arguably one of the most important architectural treasures of the contemporary UAE society – and one of the most beautiful in the world – initiated no less by the late president HH Sheikh Zayed bin Sultan Al Nahyan, who is fondly thought of as the father of UAE. Complimentary tours are conducted daily (except Friday). For active visitors, golf, fishing trips and scuba diving are amongst the activities that can be enjoyed around Abu Dhabi. In contrast, the city has an abundance of spa’s that can provide an option for luxurious rest and relaxation. This luxurious hotel, managed by The Kempinski Group, is probably the most expensive hotel ever built in the world, costing the Abu Dhabi government roughly US$3 billion. Often mistaken as the presidential palace, Emirates Palace features just under 400 rooms and suites, and most of its interior décor is in marble or gold. Offering beautifully landscaped parks and picnic grounds, traditional cafés, and an extensive waterfront promenade, the Abu Dhabi Corniche is a popular attraction during cooler months and is considered one of the city’s best hangouts.A two-kilometre beach stretches out along the west end of Corniche, this public area is accessibly for a small fee and provides beach facilities and life-guarded swimming areas.